Surviving the ghetto is like walking a minefield, or maybe dancing on the chess board. A young man is faced with violence and temptation at every school yard and street corner. Fresh is the nimble journey of one young boy through the perilous pavement of the inner city. Boaz Yakin's crisp and incisive script is brilliantly paced. Violence is endemic to the film just as it is to the ghetto. It's revealed with shocking suddenness. It explores a number of powerful issues, but perhaps most importantly, the how the ghetto strips self-esteem from its young. Yakin succeeds in painting an interesting contrast between Fresh's existence in school and in the streets. School and the ghetto meet in painful collision in the school yard. Fresh is positively Machiavellian in his machinations, but the character's native intelligence is supported by both the script and the performance. The film is incredibly powerful. Fresh is laced with powerful bursts of devastating emotional impact. I found the film could take you by your throat and stop your breadth with shocking imagery. 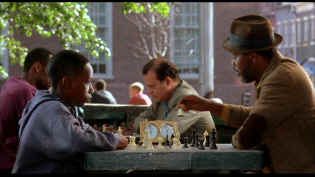 Equating the lessons of chess with the realities of the streets is a touch worthy of a grand master. Sean Nelson's cool screen presence as Fresh goes a long way toward making this a special film. He carries the film on his frail shoulders with admirable strength, like a sly wounded animal that somehow finds strength in the darkest places. Sam Jackson is wonderful as Fresh's father; hard as tempered steel yet sentimental. Giancarlo Esposito does fine work as local drug dealer Esteban. Yakin's team of filmmakers perform wonders under his lead. The camera of Adam Holender fixes a strong point of view through Fresh's eyes. Wonderful cinematography. The film's rhythms are captured to perfection by Stuart Copeland majestic score. It's orchestrated with impressive range. Copeland has created symphony that represents Fresh's life. It captures New York's inner city and it finds the right chords for Fresh internal feelings. Fresh is an outstanding DVD production. A fine looking bright transfer with excellent overall dynamic range, images have excellent theatrical pop. Colors are richly saturated with consistent depth. Detail is very clean. It so clean you can look at the texture of the tee-shirt Fresh wears in the school yard and count the fibers. There's no edginess even at high peak transitions. Straight lines and fine details are perfectly stable. Black level is very good with shadow detail in balance. Check out the beautiful glow on Fresh's face in the bedroom sequence. Night sequences pack visual punch with outstanding contrast range and deep blacks. The transfers captures the subtlety of the fine lighting. There are no evident artifacts. Music is executed with beautiful range and open feeling on the Dolby Digital 2 channel surround track. Packaged as a special edition, Fresh features audio commentary from articulate writer/director Boaz Yakin. Yakin's commentary is very anecdotal, especially in the beginning, but it sets the stage well for his own background and the beginnings of the project. Even when not scene specific, the commentary is always interesting. Various cast auditions tapes, a behind the scenes featurette, and storyboard comparisons complete the presentation. From Angels with Dirty Faces to West Side Story to Menace II Society, Hollywood has depicted youth gangs as reflections of the times. Timely DVD reviews and an easy-to-use interface. Weekly contests. This is a resource of all content-rich materials on the web relating to Central and East European cinema. The ultimate aim of the Kinoeye Archive is to provide a near-as-damn-it definitive index of intelligent and thoughtful English-language analysis of Central and Eastern European cinema on the web. Monitor bias lighting in a pre-packaged configuration. Take the strain off your eyes. A new entry in the 2001 home theater site sweepstakes. Chief focus on hardware reviews with a smattering of software. Comprehensive DVD review database. Easy to use interface with specific region searches. Click on the DVD MIA symbol for profiles of DVDs missing in action.